The best way to prepare for the coming change to your family structure is through education. 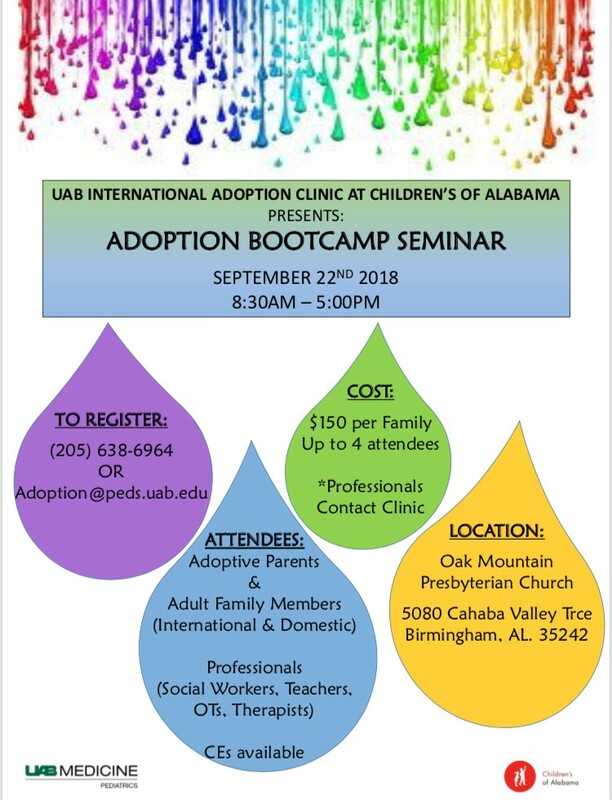 The UAB International Adoption Clinic (IAC) offers comprehensive seminars which address medical, developmental, attachment, and identity issues that they commonly see with children who have been adopted. In addition, they also discuss practical matters such as traveling, assimilating your new family/how to talk with relatives and friends about adoption, choosing a pediatrician, and a parent panel discussion. This is a great time to glean wisdom from those who have gone before you. These seminars are for both domestic and international adoptions and are offered 3 times each year. The upcoming Adoption Bootcamp Seminar is on September 22, 2018 from 8:30 AM to 5:00 PM at Oak Mountain Presbyterian Church at 5080 Cahaba Valley Terrace, Birmingham, AL 35242. The cost is $150 per family (up to 4 attendees). If you are interested in attending, you can register by contacting their office by phone at 205-638-6964 or by email at adoption@peds.uab.edu.